Cyclopia galioides E.Mey., Cyclopia genistoides (L.) R.Br. var. genistoides, Cyclopia genistoides (L.) R.Br. var. heterophylla (Eckl. & Zeyh.) Harv., Cyclopia genistoides (L.) R.Br. var. linearifolia Eckl. & Zeyh., Cyclopia genistoides (L.) R.Br. var. teretifolia (Eckl. & Zeyh.) Kies, Cyclopia heterophylla Eckl. & Zeyh., Cyclopia teretifolia Eckl. 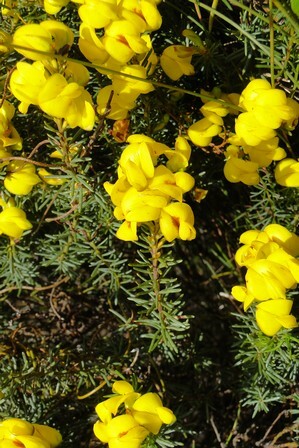 & Zeyh., Galega genistoides (L.) Thunb., Ibbetsonia genistoides Sims, Podalyria genistoides (L.) Willd., Sophora genistoides L.
One of five species of Cyclopia used for honey bush tea. Harvesting of wild subpopulations to supply the tea industry is widespread and overharvesting is causing population decline. Lowland subpopulations have experienced habitat loss due to urban development and crop cultivation. Decline in the population over the past three generations (150 years) is suspected to be 25%. Decline, as a result of habitat loss and overharvesting, is ongoing. Malmesbury to the Cape Peninsula and eastwards to Albertinia. Sandy soil, 60-1 170 m.
Declining due to overharvesting for the honey bush tea industry. Illegal harvesting (poaching) of leaves and branches for tea has been reported in a number of areas. 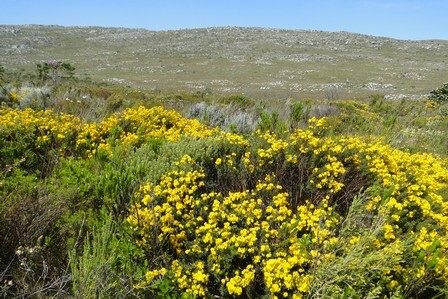 In addition, lowland subpopulations of this species in the Malmesbury, Cape Peninsula, Kleinmond, Hermanus and Albertinia region have been lost due to urban expansion and crop cultivation.